LBinary implements a high level of professionalism in every aspect of company operations. A strong drive for building business relationships with its clients is one of the underlying visions of the company. LBinary is determined to achieve excellence in every regard, by creating the best experience in the binary option market. One of the leading promotions at LBinary is bonuses on deposits. We offer 35% bonus for all investments. Experienced traders understand the importance of having a deep pocket when trading binary options and for those who wish to increase their portfolio’s security. LBinary offers clients of all account sizes to open an account. The minimum deposit amount is only $500. Minimum trade amount is $25 and traders can operate accounts in EURO and USD. Account opening can be done very quickly right from the home page of LBinary website. The LBinary site is multi-lingual and is available in English, Italian, Arabic, and French. LBinary provides a user friendly trading platform that allows trader to easily maneuver through their trading endeavors and focus on their trading strategies. Traders can fund their accounts and make withdrawals using any type of credit card, Debit card and wire transfers. LBinary has a policy of 72h withdrawals time for all account types, this help traders to feel safe and comfortable, their liabilities and exposures are professionally handled. Moreover, payout for client’s profit is guaranteed. The technology team at LBinary constantly works to generate the nest trading environment possible, and strives to be pioneers of technological breakthroughs in the market. For short-term investments, LBinary offers 60-Second Options, which expire precisely 60 seconds from the time of entry into the position. This style of trading is intended for traders who enjoy fast turnover of trades. A trader can open several 60-second options simultaneously, all of which will expire within a minute of the time of entry. LBinary is operated by a team of business professionals, and technological innovators. The LBinary Custumer support is available to assist all clients in various languages, 24 hours a day, 7 days a week by phone, email, Skype and live chat. They are always there in order to receive feedback, suggestions, and comments from traders, in an effort to provide the best possible trading environment for their clients. LBinary is definitely one of the more interesting, easy and safe brokers out there at the moment. 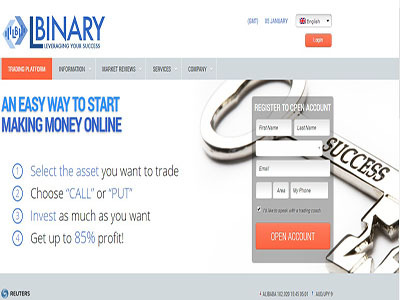 LBinary found a way to quickly become a very professional and reliable binary options broker. LBinary provide Educational tools directly on their website, and you can receive personal training from their brokers. The trading experience is pleasant enviroment and user-friendly. LBinary also offers some of the best promotions found across the binary options market. The combination of their staff of professionals and technological advances is what sets them apart from the rest. You will receive personal attention around the clock, and in several languages. LBinary is recommended for traders of all types, whether novices or highly experienced traders.